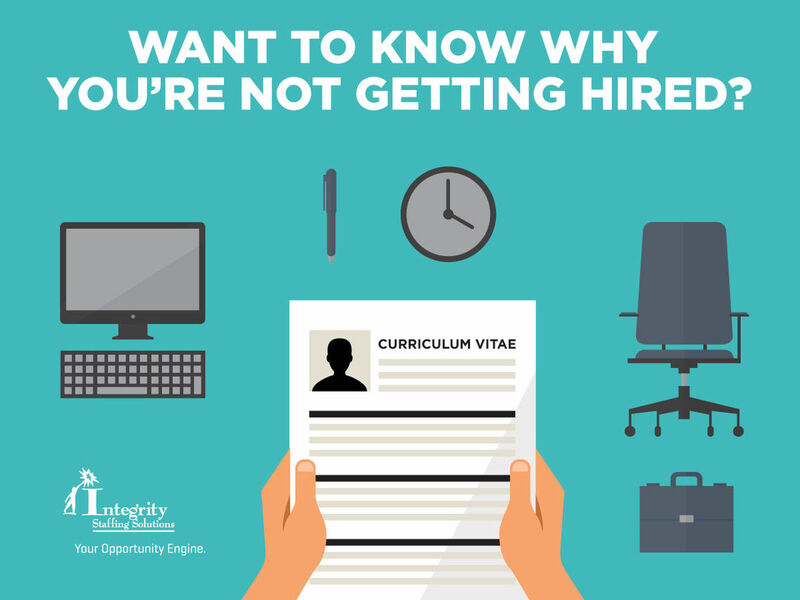 Integrity Staffing Solutions – Want to Know Why You're Not Getting Hired? Home>Blog>Want to Know Why You're Not Getting Hired? Want to Know Why You're Not Getting Hired? Sometimes job seekers do things with the best of intentions, but their actions give a completely different impression from what they meant. Let's look at our top 3 unintentional resume and interview fails, and see if they seem familiar. "Objective: to claw my way to the top by any underhanded means necessary, and then rule with a benevolent hand, spreading peace and justice." That's an actual quote from a resume. The writer probably thought he was being witty and standing out from the crowd. But how did he come across to the recruiter? He failed on two counts: he did not provide the necessary information about himself, and he gave the impression that he did not take the job opportunity seriously. It would have been far better to skip the humor and stick to what the employer was looking for: reasons why hiring this candidate would benefit the company the most. As we've said before, check absolutely every detail about how you are presenting yourself professionally, both in your resume and in person at the interview. Do it twice. Three times. Get a friend to do it with you. Of course you want to act confident, not like you're trying too hard. But don't go to the other extreme and look like you're trying too little. This signals that you don't really care whether you get this job or not. Employers prefer applicants who seem to be enthusiastic about the company and how they, if hired, can contribute to its success. After all, those are the candidates most likely to fit in with the team and reward the employer's investment in them. So, do your homework, tailor your resume to each particular job you apply for, and come to the interview armed with research about the company and the position. Smile, make eye contact and use a lively tone of voice. We guarantee you'll make a better impression than your competitor who acts like he's not interested. These 3 don'ts should be just a starting point for you to take a good look at what you say, write and do during your job hunt — and see yourself as recruiters do. It could be an easy fix that changes all those "noes" into one fantastic "yes."